New York Sports Plus: Chill. Here I am again, as the voice of reason after the Knicks selected an international prospect, and the fans booed him mercilessly. Three years ago, I was forced to defend Kostas Papanikolaou after the Knicks selected him in the second round, and guess what? I was right. It took him a couple of trades to find an NBA home, but Papanikolau landed in Houston, and was a legitimate contributor off the bench for the Rockets, which is great return for the 48th pick in the draft. This time, it's under a different regime, and it's a totally different situation. Porzingis isn't a late second round stash pick, he's a highly touted first rounder who's going to be expected to carry the franchise for years to come, well after Carmelo Anthony is gone. 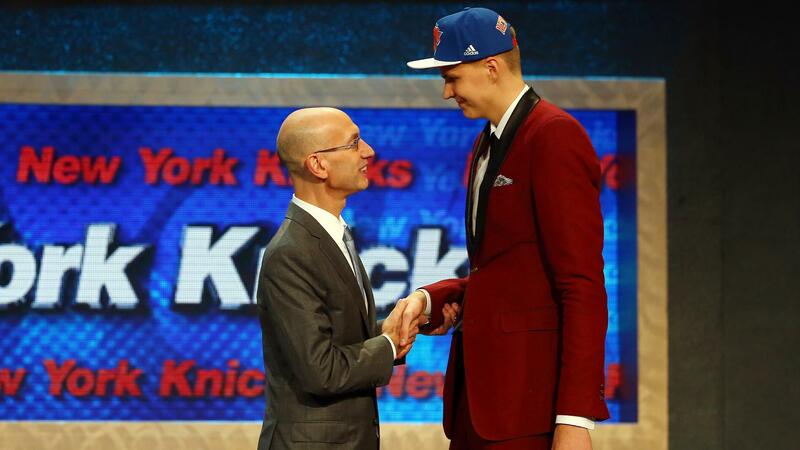 Porzingis is a massive talent, and I'm not just talking about his seven foot plus frame. No, he was not the safest pick on the board at number four. Justise Winslow, Stanley Johnson, and Willie Cauley-Stein just to name a few probably have a higher floor than Porzingis, but the sky is the limit for the Latvian. He can shoot, has great footwork on the perimeter, and can finish at the rim despite his excessively lanky frame. He was able to improve his post game last season, but it's nothing to write home about. He has tools that could make him a good defender, but his length alone will do for now. Clearly, he's a project. He needs to put on some weight to be able to handle the more physical style of play he'll encounter in the NBA, but overall he has a lot of skills and can be a force a few years down the road. So, why all the hate, the angry hot takes, the boos, the tears, and general hopelessness in response to this selection? So is the dude on the right, and I think he's okay. No, seriously, European big men are risks. Look at Andrea Bargnani, Jan Vesely, Nikoloz Tskitishviligiojgtiohyuihyuigtkosaskoprasopkakopogfnjtuioty (often shortened to Tskitishvili), and Darko Milicic. Okay, I hear you, voice in my head. And I ask you, what is the connection between these players other than the simple fact that they were born in the same continent and that they're large? Oh, nothing? If "the Europeans" were all such busts, NBA teams would have stopped scouting players there a long time ago. Porzingis wouldn't have been considered a top tier talent in this draft for the past year if simply his country of origin were cause for major concern. Maybe talk to me about his build, or his questionable rebounding, and I'll listen. But throwing out where he was born is not a legitimate argument. The Gasol brothers, they're pretty damn good. That Dirk dude pictured above, he's not too shabby himself. Not a big man, but Tony Parker may have been the best point guard in the game at his peak. His European descent isn't an automatic black mark against him. It may raise some eyebrows, but his talent should put those concerns to rest. Also, read this. Any questions? He wasn't playing against good enough talent. Anyone can look good against the scrubs in Spain. Or maybe he was playing in the second best professional league in the world, against guys much better than the majority of players in the NCAA. Put his Sevilla team up against Duke, and watch what happens. He won't be ready for a few years. No, he won't be. News flash: neither will the Knicks. No matter who they happen to sign in free agency this year, whether it's the absolute dream scenario of LaMarcus Aldridge and Goran Dragic (which leaves the Knicks with no money to fill out the rest of the roster, by the way), or a more realistic combination of Greg Monroe, David West, and Patrick Beverley (or players of a similar caliber), the Knicks were in no way going to win the title this season. It's hard to hear this, I know, but they weren't going to win a title next year either. In fact, they're probably never going to win another championship, but let's not go down that rabbit hole. Yes, Carmelo Anthony is getting older and about to exit his prime, if he hasn't already. Yes, the Knicks have a chance to make the postseason depending on how free agency goes, and had the potential to augment their chances in the present day by grabbing a guy like Winslow. But, when afforded the opportunity to pick fourth in the draft, why not go for the home run? If handled correctly, Porzingis can be the franchise cornerstone this team needs to carry the torch in the post-Anthony era. He's a seven footer who can shoot. While that may remind you of Andrea Bargnani, there's a chance Porzingis is actually good at shooting the basketball. In the "pace and space" generation that the NBA is trending towards, having a stretch four as the team's best player doesn't sound too terrible. If he turns out to be a bust, it happens. It's part of the trials and tribulations of drafting players. And when it's clear that he's a bust, you're allowed to look back at the moment that Adam Silver read his name, and cry, and boo, and hiss. Then you're allowed to yell "Why Phil, why?" You're allowed to throw things and question why God hates the Knicks and their fans. You're allowed to travel back in time and hand your 2015 self a lot of hard liquor, with the warning, "you're going to need this in a few years, thanks to that seven foot brick machine." Then and only then are you allowed to write off Porzingis. That time has yet to come, so let's not end this guy's career before it even begins. Give it time. I think Porzingis will be a star in New York. More elite GM's believe in his talent than any other player in this draft.